Compression Ratio is one of the fundamental specifications of an Internal Combustion engine. It is the ratio is the volume above the piston when it is at the bottom-most position (BDC) to the volume above the piston when it is at the top-most position (TDC). The compression ratio indicates the extent to which the air-fuel mixture is compressed in the engine. It is the ratio of the volume of the combustion chamber from its largest capacity to its smallest capacity. 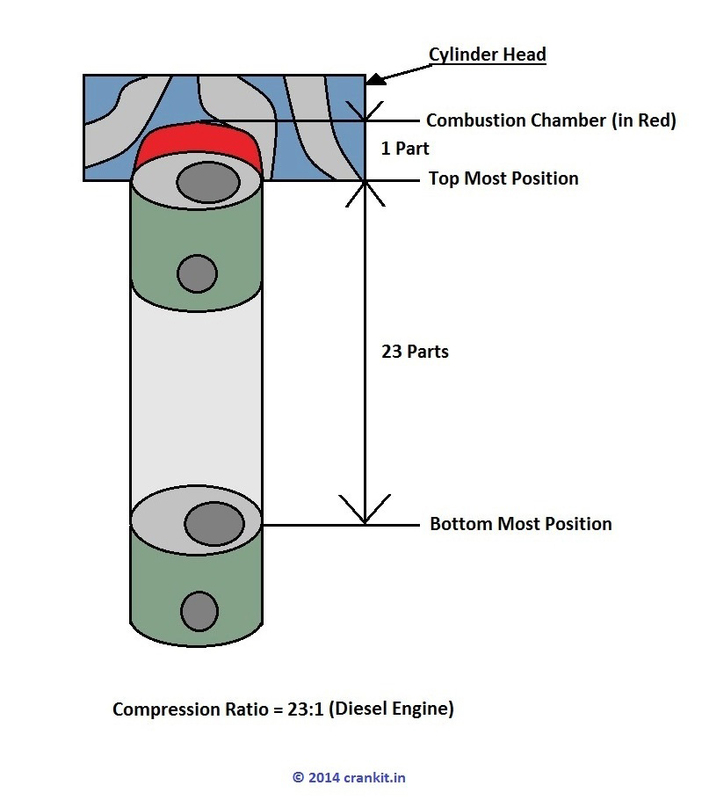 It is the ratio between the combined volume of the cylinder along with the combustion chamber when the piston is at BDC (bottom dead center) to the volume of the combustion chamber alone when the piston is at TDC (top dead center). 'Compression Ratio' is one of the fundamental specifications for all internal combustion engines. Since Petrol is very volatile, the 'Compression Ratio' for Petrol engines is typically lower. Thus, it varies from 10:1 to 14:1. The petrol engine compresses the air & fuel with 10:1 to 14:1 ratio. The petrol engine mixes petrol with air & compresses this mixture in the combustion chamber. This better mixing of air and fuel with each other makes the mixture homogeneous. An electric spark-plug then ignites the compressed air-fuel mixture with a spark. This causes the fuel to burn instantly and completely. In the case of diesel engines, the 'Compression-Ratio' varies from 18:1 to 23:1 which depends upon the engine design & construction. The petrol engines use 'Spark Ignition' method. However, the diesel engine technologies such as 'Direct Injection' & 'InDirect Injection' & 'Common-rail Direct Injection' use the 'Compression Ignition' method. However, the compression ratio remains almost the same for both the petrol engine and diesel engine respectively regardless of the engine capacity/displacement. Higher the compression-ratio, better is the thermal efficiency of the engine. Thus, the engine can extract more mechanical energy from the given mass of the air-fuel mixture. In that context, diesel engines have enhanced fuel efficiency for the given amount of fuel than petrol engines of the same size. This means let's say that you compare the conventional petrol and diesel engines with the same engine capacity of say 1.0L. Then, in the real world, the 1.0L diesel engine will consume less fuel as compared to the 1.0L petrol engine. In other words, a car with a 1.0L diesel engine would give higher mileage as compared to the car with 1.0L petrol engine under similar driving conditions. Home » Technical Anatomy » What is Compression Ratio in Petrol and Diesel Engines? How Mercedes Benz Distronic plus works? How Rear Vehicle Monitoring Works And It Can Prevent Accidents?